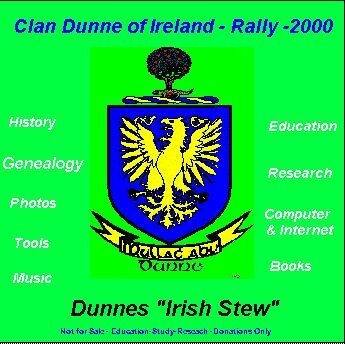 Souvenir CD Rom --- "Irish Stew"
Copies of the Clan Dunne CD Rom are now available!! The CD was prepared for distribution at the Rally and also donated to teachers/schools in the area around Dunne country. Hard to describe - a collection of literally hundreds of files of history, tales, research, Irish Annals, photos, maps, etc. Over 6700 pages of reading material, some 70 maps, 500 plus photos of Ireland. Download the index now to review all of the contents before you order! Welcome to "Dunne's Irish Stew"
This effort was originally begun to support the "Clan Dunne of Ireland" Rally by providing the capability of presenting a Slideshow of photographs of the people and places around Clonaslee, Tinnahinch and County Laois, along with musical background of short Irish music segments. As the work got underway, it was decided to expand the effort to include a few files related to the history and genealogy of the Duinn/Dunne/Dunn families from these areas. Given the capability of a CD-ROM to contain an unbelievable amount of material, it was finally decided to create a CD which could be used by students and others in pursuing the research and study of Irish History and Genealogy, using the realtively new capabilities of combining the use Computers and the literrally inexhaustible information available thru use of the Internet. When one realizes that there are several millions of Internet "sites" that can be found thru the use of the numerous "search engines" (almost all of which are free to computer users), and which can be used for learning as well as teaching, the possibilities for use are truly unbelievable. In the areas of History, Archeology, Geography and Genealogical sites, a conservative estimate would range into thousands. The capability of finding articles, data, extracts and in many cases the entire contents of Books -- all while sitting at home or in school with a computer and an Internet hook-up, seems almost endless. The final product which you are reading about now, is truly representative of the name of "Dunne's Irish Stew". It now includes several hundred files of different types. Most of them relate in some way to the Dunnes and their surroundings, history, genealogy, photographs, music, extracts from ancient books and manuscripts, etc - along with a few utilities to assist in making their use more readable and useful. On the light side, it also include files for entertainment and enjoyment. This CD-ROM is not a "program". It's a reference, learning and teaching tool.